If you’re interested in going to New Zealand, but don’t think you can afford the cost of it, you might want to look into WWOOFing. WWOOF stands for Willing Workers On Organic Farms, and it’s a common arrangement in New Zealand that allows visitors to stay in the country at a much cheaper cost than if they visited on their own. Generally visitors work between 3 and 6 hours a day on a farm, an in exchange they’re given three meals a day and accommodation. The tasks that WWOOFers are given vary tremendously – some may work in a garden, some may pick fruit, and some may be working on a sailboat. Part of the adventure is the variation in the tasks; no two WWOOFers will have the same story! There’s also the question of who you’ll be living with, since no two hosts are alike. You might be with a family, or a couple, or a single person. When choosing from your options of where to WWOOF, you’ll want to take your hosts into consideration. After all, they’ll be the ones you’re working for. You want to make sure that you think you’ll be a good fit. WWOOFing certainly isn’t for everyone, but for those whom it’s well suited to, it can be an experience that leads to great friendships and wonderful memories. There’s a camaraderie among those who have been WWOOFers, due to the experiences they’ve shared. So how does one become a WWOOFer? 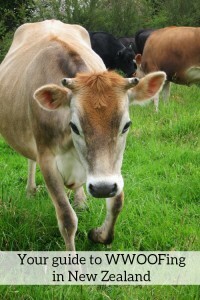 Read more about WWOOFing in New Zealand on GoNOMAD!